Over the past years, we’ve made it a habit to create handmade gifts for the kids school teachers. They receive a lot of generic chocolates, candles, mugs or bottles of wine, so I think that giving them something a little different, is special. Apologies for the night-time photo. This was gifted the next day, so I never got a good quality photograph of this pillow. Last year, my daughter had a male teacher… the same teacher which my son had a couple of years earlier. When it came to the end of the school year, my husband and son worked together to make him a pen. My son chose the acrylic blank and they turned it together on the lathe. It was a lovely gift, unique and one which the teacher loved and appreciated. 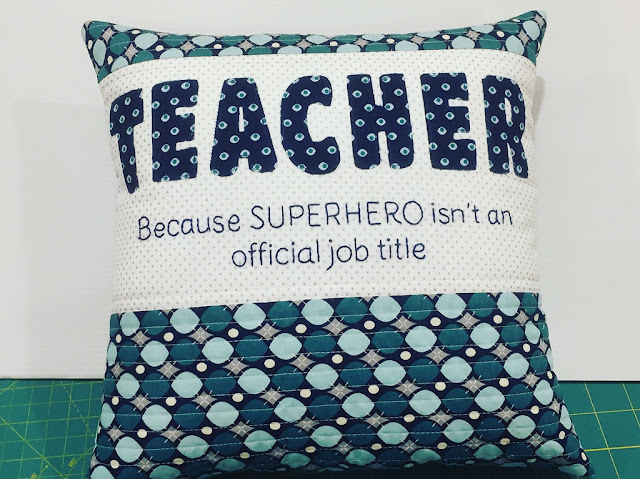 When it was time to think of a gift for this same teacher, I decided to make him a custom pillow, in “man” colours and prints. It’s a 14” finished pillow, but can be made to any size to suit any pillow form. If you’d like to make your own Teacher Appreciation Pillow, you can download and print up the pattern right here. The “Teacher” is raw edge appliquéd using heat n bond to hold the letters in place. I used my machine to applique the letters with matching cotton thread. I sewed as close to the edge of the letters, without sewing over onto the background fabric. The stitched section was embroidered with a simple back stitch and 3 strands of cotton floss. If you're unsure of how to work the backstitch, here's a great video tutorial by Mary Corbet of the blog, Needle n Thread - a truly wonderful resource for everything related to embroidery. I made my Teacher pillow for a man, but there’s no reason you couldn’t make this for a female teacher using lovely girlie fabrics from your stash. Imagine it in pretty pastels or florals. Hmm… might be an idea to make another one for one of my kids teachers this year, right? Check out another teacher appreciation pillow (including a free pattern) which I made a few years ago.